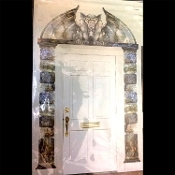 7-Foot Medieval Gothic GARGOYLE STONE CASTLE EERIE DOOR ENTRANCE Create-a-Scene can be used as a door surround, over a fireplace mantle, or as a background for your table or photo booth. Kit includes 2 pieces that combine to measure approx 7-ft high x 5-ft wide (210cm x 150cm). Easily cut and customize to fit any area. The 5-foot tall stone pillars are printed on a clear plastic sheet, and can be cut to fit nearly any configuration. Add the Gargoyle to the top for nearly 7-Feet of Gothic Décor! GARGOYLE STONE CASTLE EERIE DOOR ENTRANCE is a unique decoration that is quick, convenient, and practically mess free. Just hang this large plastic decoration to any flat surface using your own tape, thumbtacks or pins, and watch as it changes into a scary scene right before your eyes! Reusable plastic sheet fits over most smooth surfaces and will need to be kept in place with your own tape or similar temporary adhesive, NOT included. Image is printed on a clear plastic sheet that measures approx 7-ft high x 5-ft wide (210cm x 150cm).